What is a company culture ? A company culture is not only a sum of your values. It’s being built everyday through myriads of social interactions and processes. Learn to understand and challenge them in order to adapt to the digital era. Fostering continuous learning should be your priority when adapting to the digital world. This is why you need to change the way you train. To be efficient your culture must be engaging. To be engaging, it needs to be social. Discover how putting social features at the heart of your training programs can give life to a strong company culture. Culture is concrete, resulting from everyday practices. Working on these daily practices as well as reviewing your managerial model are the better ways to accelerate digital transformation since it involves implementing new work habits among employees. 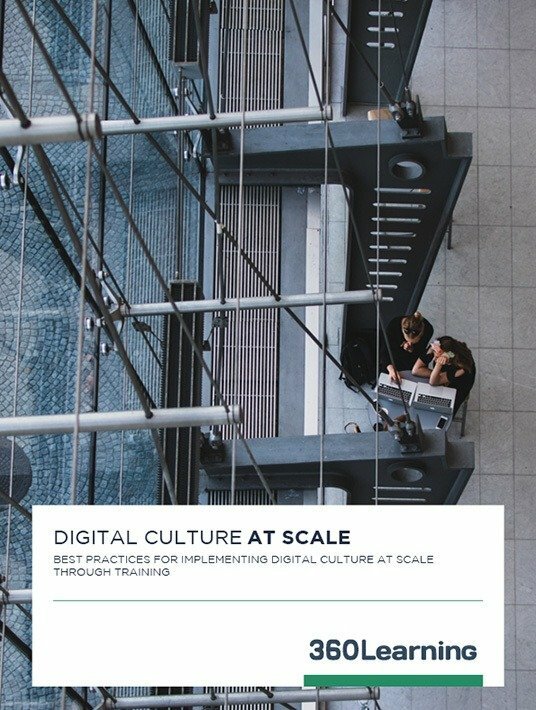 Company culture and corporate training go hand in hand, just as digital culture and eLearning do. One thing is for sure, you will struggle bringing digital transformation to your organization as long as you don’t invest in training. To be more precise, in a collaborative eLearning process. Studying on this white paper by 360Learning, will develop in you the courage needed to successfully lead your organization. The kind of courage that inspires innovation and eventually makes your company’s culture engaging.